Question of the Month - Can't we all just get along? You’ve probably seen this iconic symbol on the back of many cars. It’s the famous “coexist” bumper sticker. When I first saw this, I thought it was certainly clever, but I was also disturbed by the message. What’s the general message? In most cases, I believe people are wishing we could just all get along. What’s wrong with that message? On one hand… nothing. I think we should be able to get along with those who hold different beliefs. Romans 12:18 states, “If it is possible, as much as depends on you, live peaceably with all men.” When you think about it, the majority of people on the planet have a different beliefs than you. Are you supposed to eliminate them or force them to submit to your view? Obviously not. That certainly isn’t Scriptural. On the other hand, the intended message behind this symbol isn’t so much that we should just “get along”, but rather we should acknowledge that all beliefs are worthy of equal respect, are equally valid or even are all basically the same. This view, however, is problematic. Offering just one example for now, Mormons believe in multiple gods (i.e. God the Father is God and Jesus is God… just not the same God, and we ourselves can become gods, etc.). Christians believe in one and only one God, manifest in the Trinity. Hindus believe in one supreme being expressed in perhaps millions of manifestations. Atheists believe there are no gods at all. How could they possibly all be right? It is not my intention in this article to discuss those religions that might seek to harm others. It should go without saying that while it’s reasonable to be tolerant of other views, it’s certainly not sensible to just “give a pass” to proactively violent groups. Here’s another point to consider. For those who believe most (if not all) of the existing beliefs are equally valid ways to God, then it was absolutely ludicrous for Jesus to have allowed Himself to be tortured and crucified, knowing people could be saved apart from this extreme sacrifice. That would effectively demote Jesus from being the Son of God to just another fool. Get to know others and sincerely learn what it is they actually believe, so you are in a better position to know what questions to ask. Do this in a very gracious manner to show genuine care for them, as opposed to just wanting to win an argument. Be patient as God uses the Holy Spirit (through your testimony and your sharing of actual Scripture) to remove the spiritual blinders they have, peacefully coexisting along the way. If you are dealing with someone who makes it virtually impossible to have a rational, respectful conversation, you will have to pray about whether or not God wants you to hang in there, or move on to someone else who would be more receptive to the truth. 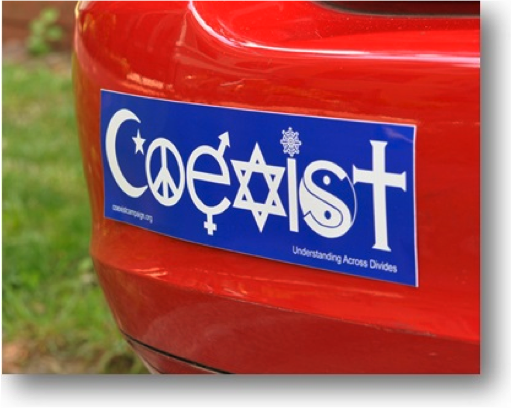 So the next time you see someone with a “coexist” bumper sticker, if you are able, ask them what led them to putting it on their car. It’s a great conversation starter and God can use it in a mighty way! Much more could be shared regarding this topic, but our space is always limited in these brief articles.